This textbook was developed from an idiom shared by the authors and contributors alike: ethics and ethical challenges are generally black and white - not gray. They are akin to the pregnant woman or the gunshot victim; one cannot be a little pregnant or a little shot. Consequently, professional conduct is either ethical or it is not. Unafraid to be the harbingers, Turvey and Crowder set forth the parameters of key ethical issues across the five pillars of the criminal justice system: law enforcement, corrections, courts, forensic science, and academia. It demonstrates how each pillar is dependent upon its professional membership, and also upon the supporting efforts of the other pillars - with respect to both character and culture. With contributions from case-working experts across the CJ spectrum, this text reveals hard-earned insights into issues that are often absent from textbooks born out of just theory and research. Part 1 examines ethic issues in academia, with chapters on ethics for CJ students, CJ educators, and ethics in CJ research. Part 2 examines ethical issues in law enforcement, with separate chapters on law enforcement administration and criminal investigations. Part 3 examines ethical issues in the forensic services, considering the separate roles of crime lab administration and evidence examination. 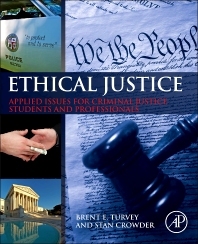 Part 4 examines ethical issues in the courts, with chapters discussing the prosecution, the defense, and the judiciary. Part 5 examines ethical issues in corrections, separately considering corrections staff and treatment staff in a forensic setting. The text concludes with Part 6, which examines ethical issues in a broad professional sense with respect to professional organizations and whistleblowers. Ethical Justice: Applied Issues for Criminal Justice Students and Professionals is intended for use as a textbook at the college and university, by undergraduate students enrolled in a program related to any of the CJ professions. It is intended to guide them through the real-world issues that they will encounter in both the classroom and in the professional community. However, it can also serve as an important reference manual for the CJ professional that may work in a community that lacks ethical mentoring or leadership. Stan Crowder is a retired U.S. Army Military Police Colonel. During his military career, Stan served in numerous positions including: MP Commander, Chief of Investigations for the Inspector General of Georgia, Counterdrug Commander, Battalion Commander, and Chief of Personnel. He served seven years as a civilian police officer; 5 years with Cobb County (GA) PD and 2-years with Marietta (GA) PD. He teaches at Kennesaw State University, Kennesaw, Georgia, USA, where he has been teaching since 1999 and was selected as the 2007 recipient of the Betty Siegel teaching award. 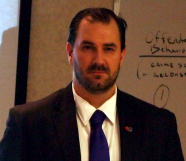 His teaching areas include: Criminal Investigations, Serial Offenders, Forensic Victimology, Criminal Profiling, and Ethics in Criminal Justice. Stan has a Ph.D., MBA, and BS. He is the President of the International Association of Forensic Criminologists and the past president of the Cobb County Law Enforcement Association. He has written three textbooks with Dr. Brent Turvey: Ethical Justice: Applied Issues for Criminal Justice Students and Professionals, Anabolic Steroid Abuse in Public Safety Personnel, and Forensic Investigations: An Introduction published by Elsevier. He has contributed chapters to other textbooks. He has published articles on teaching and criminal profiling. In June 2017, Dr. Crowder was appointed to the Georgia Peace Officer Standards and Training Council as an advisory member. He can be contacted at: scrowder@kennesaw.edu.